NOW Beta-1,3/1,6-D-Glucan (Beta-Glucan) is a bioactive carbohydrate derived from the cell wall of Saccharomyces cerevisiae, commonly known as Bakers' yeast. Scientific studies have shown that Beta-Glucan supports immune function through its ability to stimulate macrophage activity. NOW Beta-Glucan is blended into a synergistic base of Maitake Mushrooms for added power. Beta 1,3/1,6 Glucan is an all-natural, food-based dietary supplement purified from the cell wall of baker"s yeast (Saccharomyes cerevisae). Technically it is a highly refined carbohydrate made up of a string of glucose molecules, with the fats, proteins and other polysaccharides removed. Other sources of Beta glucan are oats, barley, mushrooms and algae. Beta Glucan stimulates the macrophage, a white blood cell that is responsible for a multitude of actions which protect and enhance the immune system, and provide optimum resistance to any possible health assailants. Macrophage cells are one of the principal cell types involved in natural immunity. They swallow up foreign particles and destroy them. Macrophages produce chemicals that signal other immune cells to move to the site of infection and produce such effects as fever. Macrophages also produce growth factors for cells that repair injured tissues. It is for anyone who wants to maintain or enhance the effectiveness of his or her immune system; people who experience daily stress; those who want to slow the aging process; people who are susceptible to allergies, autoimmune disease, infectious disease, slow and incomplete healing, and those who suffer from HIV/AIDS, or cancer. 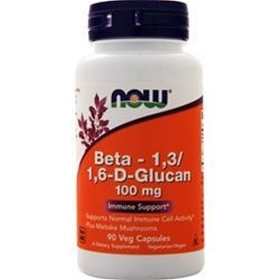 Beta Glucan should be taken as a daily supplement because your immune system will fluctuate from day to day. When it"s in its "down" phases of this cycle, you will be prone to illness. People who have impaired immunity from any cause including chronic fatigue, fibromyalgia, or persistent viruses, can take beta Glucan to bolster their defenses. Those who suffer from chronic degenerative disorders such as diabetes mellitus or chronic inflammation may also benefit from Beta Glucan"s immune enhancement. Those habitually exposed to environmental pollutants, UV radiation, and other toxins could benefit from the antioxidant effect and potent free-radical scavenger effects. Free of:wheat, corn, soy, milk, salt, preservatives, colors, synthetics.